As a general practice, whenever you contact (mt) Media Temple Support, you will receive a support request that summarizes the call. There are times when you will need to respond to provide written authorization for your request. From the Overview page, scroll down to SUPPORT CENTER. Select the support request for which you'd like to respond. You will first be asked to rate your support experience. You will be able to rate the experience by timeliness and quality of response. Otherwise, click on the link: "No, thanks, continue with support request" and enter your reply. Click the SUBMIT RESPONSE button when you are ready to send your reply. That's it! Let us know if you have any other questions. How do I close a support request? All support requests are automatically closed after nine days if you have not submitted a response. If you would like to close a support request immediately, you can follow the above steps 1 - 4 to access your support request. 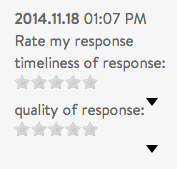 Instead of composing a reply, tick the box for Mark this issue resolved and click the SUBMIT RESPONSE button.